This is not so much a how to guide as a compendium of what we know of the sourcing of the parts needed to replace and repair these items. We were able to get disks easily enough on eBay. Some later Virages seem to have had Jag XJS brakes. 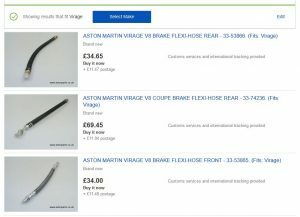 Original Virage hoses (or something that fits) seem to be available on eBay. I can’t show you a link as they expire, but here’s a screen shot taken today, searching on ‘Virage brake hose’. Suspension joints are from the Jag XJS of the same vintage.